The second half of an ambitious, months-long simulated Mars mission is now underway. 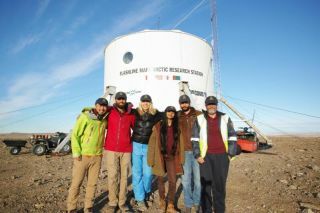 Six crewmembers have arrived at the Flashline Mars Arctic Research Station (FMARS), an outpost in the Canadian Arctic that's run by the nonprofit Mars Society. The milestone marks the beginning of Phase 2 of the Mars 160 mission, which aims to help humanity prepare for real crewed missions to the Red Planet. Mars 160's length makes it special. While the Mars Society has mounted numerous missions to MDRS and FMARS, these previous efforts have generally lasted just a few weeks at a time. The FMARS crew will be led by Frenchman Alexandre Mangeot. The other on-site team members are Japan's Yusuke Murakami; Australian Jonathan Clarke; Russian journalist Anastasiya Stepanova; Anushree Srivastava, who is from India but currently lives in England; and American Paul Knightly. All six are veterans of the MDRS portion of the mission. During their time at FMARS, which is on Canada's Devon Island, the crewmembers will carry out research in a number of areas, from geology and microbiology to psychology (to investigate how small groups function in an isolated environment, for example). The protocols and programs will be similar to those employed at MDRS, to gauge how different locations affect the data collected, Mars Society representatives said. "Mars 160 is a unique mission that combines and compares both desert and Arctic Mars analogs as field test environments for Mars mission operations research," Mars Society president Robert Zubrin said in a statement. "The Mars Society has opened up this vital field of research, which is now expanding worldwide. With this mission by an outstanding crew drawn from four continents, we will advance it substantially. On to Mars." You can follow the Mars Society's Mars 160 mission here: http://mars160.marssociety.org.